Whatever your interest, be it wildflowers or fungi, canals or industrial archaeology, there is plenty to see and do in the Valley. Local libraries in Cheshire East Libraries and Trafford Libraries hold contact details for all the special interest groups in Cheshire East Community Groups and Trafford Community Groups: everything from the Ramblers Association or Conservation Volunteers to people interested in birds, plants,fungi, mammals and insects; industrial archaeology to local history. 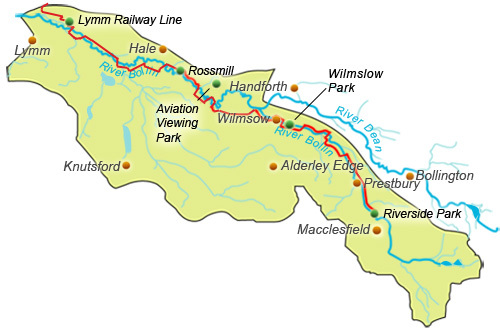 The River Bollin is 49km in length running from the hills surrounding Macclesfield Forest to where it joins the Manchester Ship Canal at Bollin Point near Lymm. The main source of the River Bollin is on Toot Hill in the Hamlet of Forest Chapel on the edge of Macclesfield Forest. Half way down its length the Bollin is joined by the River Dean. The catchment area of the two rivers combined is 273 squared kilometres. Bollin Valley Partnership manages sites across the valley as well as the Bollin Valley Way which approximately follows the River Bollin from Riverside Park in Macclesfield to the River Mersey near Partington. The map below shows the extent of the valley, its main towns and the location of our sites and the Bollin Valley Way.